Considering a new pool in your backyard but also think you and your family may instead make do using one at your gym, club, park, school, or community center? Swimming is one of the best forms of exercise because it thoroughly works muscles while being gentle on joints. However, like any kind of workout, consistency is everything. The convenience of a home swimming pool encourages regular usage. With today’s busy lifestyle, having an aquatic fitness center right outside your door can make it easier to stick to a regular routine. In addition, you won’t have to worry about other swimmers potentially distracting you or even getting in your way like you would at a public facility. A small body of water used by dozens—even hundreds—of people can pose contamination risks. Compared to a private residential pool, a public facility with heavy bather usage has increased chances for someone introducing a virus or bacteria into to the environment. Worse, compared to swimming in a pool in your own home or one owned by your friend, a pool in a public setting can be more conducive to irresponsible attitudes. The unfortunate reality at public pools is that the odds are higher that some swimmers will exhibit poor behavior, such as ignoring pool-hygiene etiquette. And although many public pools are expertly managed, errors in water-chemistry can occur, resulting in contamination. Even the Center for Disease Control has warned about the risks of public pools. Owning a residential pool is a great way for the family to spend time together in a fun, healthy atmosphere. As a focal point for socializing, a pool can be terrific for fostering relationships and can encourage your children to spend more time at home. A backyard resort can even help entice other people’s children to your home. When your kids have their friends over, you can get to know them better. Of course, there are other great advantages of a backyard pool, from raising your property value, to the ability to relax in a quiet, private environment. Best of all, with today’s advanced technology, pools are easier to maintain and more affordable to operate than ever before. 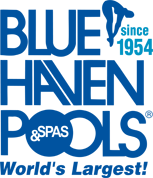 For more information about building your own backyard oasis, contact the Blue Haven Pools design & construction office in your area.